By Mateusz Mucha and James Mathison. How to calculate aspect ratio? How to calculate screen size? Aspect ratio calculator and screen size calculator – what are these and what do we use them for? In brief, they are two very essential, quick and comfortable tools used to resize your images or videos for the purpose of adapting them to the requirements of your project. Aspect ratio is a proportional relationship between the width and height of an image. It is usually described with two numbers and a semicolon between them, for example, 2:1. This means that the width of the image is twice its height. It’s a very useful device for resizing photos or videos for your blog. 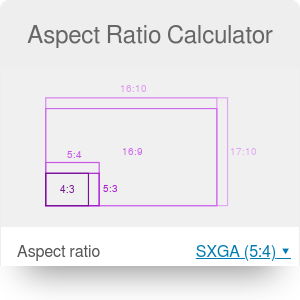 Applying the aspect ratio calculator is very easy. You need to divide the original height by the original width and then multiply this number by the new width to get the new height. These steps will give you the correct height for your edited image. Screen size detects the physical dimensions of your display in inches and indicates the number of pixels that can be displayed on the screen of your computer. It’s essential for every webmaster to be able to calculate screen size. In order to do that, you can either calculate it on your own or use our calculator. The very first thing you need to do is to chose you aspect ratio. Then, you have to give any of these three measurements: diagonal length, width or height. It is enough to give one of them and the rest will be calculated automatically in centimeters or in inches. Mateusz Mucha and James Mathison. Aspect Ratio Calculator can be embedded on your website to enrich the content you wrote and make it easier for your visitors to understand your message.